The King of Saudi Arabia is Saudi Arabia's head of state and absolute monarch (i.e. head of government). 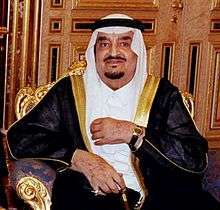 He serves as the head of the Saudi monarchy — House of Saud. 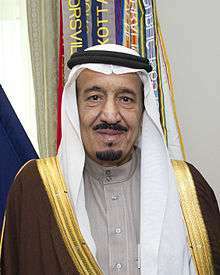 The King is called the Custodian of the Two Holy Mosques (خادم الحرمين الشريفين). 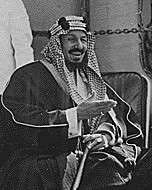 The title, which signifies Saudi Arabia's jurisdiction over the mosques of Masjid al Haram in Mecca and Masjid al-Nabawi in Medina, replaced His Majesty (صاحب الجلالة) in 1986. King Abdulaziz (also known as Ibn Saud) began conquering today's Saudi Arabia in 1902, by restoring his family as emirs of Riyadh. He then proceeded to conquer first the Nejd (1922) and then the Hejaz (1925). 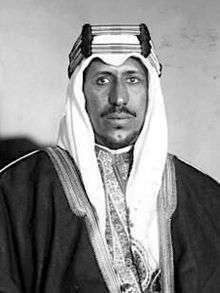 He progressed from Sultan of Nejd, to King of Hejaz and Nejd, and finally to King of Saudi Arabia in 1932. The kings since Ibn Saud's death have all been his sons, and all likely immediate successors to the reigning King Salman will be from his progeny. 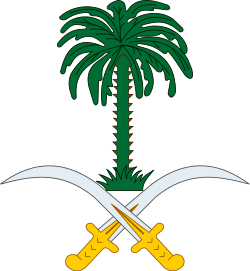 Sons of Ibn Saud are considered to have primary claim on the throne of Saudi Arabia. This makes the Saudi monarchy quite distinct from Western monarchies, which usually feature large, clearly defined royal families and orders of succession. The current Crown Prince is the first grandson of Ibn Saud to be in the line of succession. Saudi Arabia is ruled by Islamic law (Sharia) and purports to be an Islamic state, but many Muslims see a hereditary monarchy as being a discouraged system of government in Islam. Crown Prince Muhammad bin Nayef, born (1959-08-30) 30 August 1959; son of Nayef bin Abdulaziz and Al Jawhara bint Abdulaziz bin Musaed bin Jiluwi Al Saud, Grandson of Ibn Saud and Hassa bint Ahmed Al Sudairi. Deputy Crown Prince Mohammad bin Salman, born 1985 (age 30–31); son of King Salman and Fahda bint Falah bin Sultan Al Hithalayn. There is no other god but God, Muhammad is the messenger of God. ↑ Rabasa, Angel (2004). The Muslim world after 9/11. Rand Corporation. p. 164. ISBN 978-0-8330-3712-1. ↑ "About Saudi Arabia: Facts and figures". The Royal Embassy of Saudi Arabia, Washington D.C. Retrieved 24 April 2012.